Participation in the School of Applied Functional Medicine™ (SAFM) programs can qualify you to seek a certification in Applied Functional Medicine for Coaching™ (AFMC). This certification distinguishes a practitioner from his or her peers, acknowledging their advanced training in foundational functional medicine principles and their detailed, practical application in client work. Certification is a three level credentialing process, which requires successful completion of the previous level before advancing to the next level: Only individuals with active, professional practices qualify to pursue and complete the AFMC certification process. This includes completion of the following four courses and submission of the Self-Tests for each of the four courses prior to registration for the Level 1 AFMC examination: Disease 101, Supplements/Nutrients 101, Labwork 101, and Disease Begins in the Gut 101. Candidates are also required to Experience a minimum of 6 All Levels Open Coaching Calls during their Core 101 semester year access prior to registering for the Level 1 examination. Passing grade on the Level 1 AFMC certification exam. Completion of the Advanced 202 semester. This includes completion of the following four courses and submission of the Self-Tests for each of the four courses prior to registration for the Level 2 AFMC examination: Disease 202, Supplements/Nutrients 202, Labwork 202 and Cellular Metabolism. Candidates are also required to Experience a minimum of 6 All Levels Open Coaching Calls during their Advanced 202 semester year access prior to registering for the Level 2 examination. Passing grade on the Level 2 AFMC certification exam. Submission of a patient/client Case Study and Assessment that successfully demonstrates your strong competence and thorough understanding of relevant functional medicine interconnectedness and principles (more details below). Passing grade on both the Level 1 and Level 2 AFMC certification exams is required prior to registration for the final Level 3 certification process. Level 2 and Level 3 cannot be pursued within the same AFMC examination window. All credible licenses and professional certifications require continuing education. Ongoing practice in case assessment using functional medicine science and evidence of skills retention are both necessary for a practitioner to retain active AFMC certification status. Recertification is required every 3 years. The Recertification exam is free of charge when taken *prior* to certification expiration. If a certification exam is not taken or does not receive a passing grade prior to the current certification expiration date, then a $300 exam fee will be required to pursue Recertification. Ongoing participation in SAFM All Levels Open Coaching Calls is a powerful tool for continuing education in functional medicine science as well as a way to maintain well-honed practitioner skills in case assessment. To qualify for the Recertification exam, a practitioner must participate in at least 6 All Levels Open Coaching Calls over the time period since their original Certification (or most recent Recertification). You may choose to experience these Calls in a live format or via recording. You must earn a passing grade on the recertification exam (85% or better) which will involve questions related to the assessment of an actual client case. Recertification exams will have the same format as that of the Level 1 and Level 2 AFMC exams (a mixture of multiple choice and essay questions, conducted online in an open-book format over a timed two-hour window). The AFMC board will maintain an online publicly-accessible roster of AFMC certified practitioners and their current certification status. Practitioners who do not achieve Recertification every three years will be listed as having an Expired certification status. Upon Recertification, a practitioner will receive via mail a new seal to place on their AFMC certificate, indicating their ongoing education and current validation of skills competency. If you are a current Core 101 or Advanced 202 semester participant, the cost of one respective certification exam window is included in your semester fee, as long as the examination is completed within 18 months of the Semester start date. You must notify the SAFM Admin of your intent to sit for the desired certification exam by the deadline for that window (details for exam windows below). Individuals wishing to complete their examination at a later date may do so with Ad hoc registration and fee. Individuals who have already completed either or both semesters are eligible to complete the associated certification processes at any point in the future for a $300 examination fee (per exam, which includes an exam review course). Again, you must notify the SAFM Admin of your intent to sit for the desired certification exam by the deadline for that window (details for exam windows below), as late registrations cannot be accommodated. There is no charge for re-certification if completed either during the examination window prior to or immediately after the certification anniversary date (exact timing may vary per individual). All three Levels of initial Certification and Recertification are offered every four months, and they are set for (February 15th to February 24th), (June 30th to July 9th), and (October 5th to October 14th) every year. Approximately two months before each 10-day exam window, registration will open. Students who are currently enrolled in the Core 101 and Advanced 202 semesters will automatically receive an invitation to register and participate in the appropriate certification exam once the registration window has opened. Please note that all required courses and self-tests must be completed prior to the registration commencing for an examination window. Each time the certification window opens, you must complete the Online Exam / Case Study submission within the stated ten-day period. You may only attempt one certification level per open exam window. 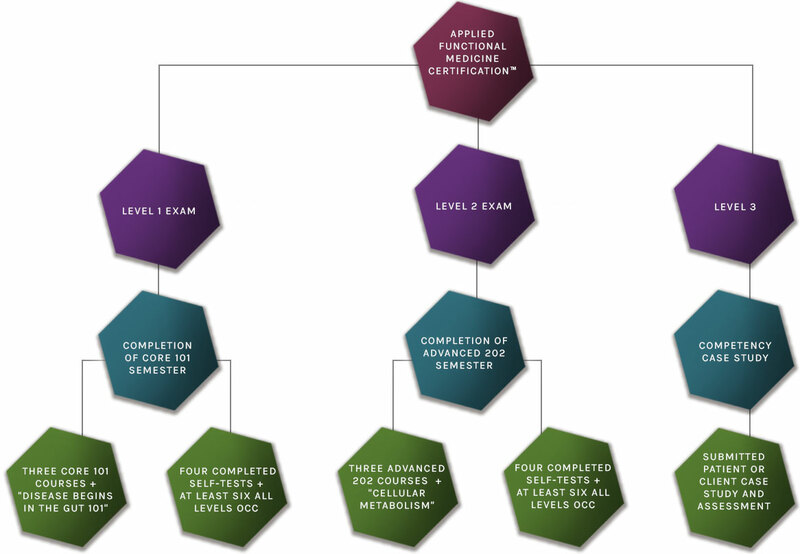 Each Level of certification must be completed before progressing to the next. Immediate continuing access membership to your student account on the SAFM site to allow you to thoroughly review course material in preparation for the exam. A comprehensive final review course which you may experience as often as you wish. The appropriate certification exam (or competency case study submission) and grading. For Level 1 and Level 2 exams, a maximum of two valid attempts are allowed for each certification window. For Level 3, one Competency Case study submission is allowed per certification window. Again, please note that all required courses and self-tests must be completed before you will be able to register to attempt the next Certification level. Please note: thorough preparation and study are important. While you are indeed welcome to use reference material during the exam, you will not have time to “go and find” answers to a large number of questions within the allotted exam time. Successful completion of a certification or recertification exam requires a minimum passing grade of 85% on that single exam. Pass/Fail Determination will be communicated to each student via email within 48 business hours of exam completion. If a passing grade is not achieved on the first two-hour attempt, each exam may be taken one additional time during the then-current examination window plus five calendar days (no extension exceptions are available, so please be sure to plan accordingly). If a passing grade is not earned on the second attempt, further attempts must be delayed until the following examination window (approximately four months later) to allow for additional study, and a separate certification exam registration and fee will be required. This certification exam process and content is overseen and accredited by our SAFM Scientific Review Board. Beyond successful completion of both examinations, the AFMC certification also requires you to demonstrate competence in using the knowledge you have learned by the submission and approval of an actual case study (from the practitioner’s own client or patient population). Competence must be demonstrated in the functional medicine principles from the eight included semester courses as well as other key areas relevant to the chosen case. The case must also demonstrate sound and thorough identification of interconnected dynamics in the person’s aggregate system (e.g. health history, life experiences, diet, behavioral choices, mindset/perspective, symptoms, medications, lab work, and supplements) and effective execution of recommendations, bringing resolution to the client’s primary issue/goal. You may learn more about the specific requirements for satisfactory completion of the Competency Case Study here, so you may choose carefully when you believe you are ready to pursue this final level of the AFMC Certification process. All chosen case documentation must be submitted in the required formats prior to the end of the respective examination window. An opportunity to be included in the SAFM Practitioner Directory with customized details about your professional practice. The opportunity to be a part of the SAFM Practitioner Incubator program at a special AFMC Certified Practitioner subscription rate of $39/month (a significant savings over the regular SAFM Incubator subscription rate). This is a powerful way to continue to expand your learning, practice complex case analysis through the functional medicine lens, stay engaged with SAFM course material and all updates and Q&A access, and continue to receive community support via our WS Forum. When available, an opportunity to present a client case for an upcoming All Levels Open Coaching Call, provided you’re currently engaged in the SAFM Practitioner Incubator Program (as above). The option to open an Evexia Diagnostics practitioner account (online testing laboratory services) at a discounted rate ($250 enrollment fee waived, $50 annual account fee only) ** Due to state laws, this offer currently excludes practitioners and patients in NY, NJ or RI. As part of your account with Evexia Diagnostics, you may also receive credible, evidence-based analysis of labs via free-of-charge Functional Health Reports (FHR) for each set of relevant labs you run (normally there is a per-report fee). Includes Peer-reviewed, functional “optimal ranges”, along with standard reference ranges. Practitioner & Patient versions available. Free of charge, AFMC Recertification Exam, to ensure continuing education and ongoing validation of competency (a $300 savings if taken prior to your certification expiration date). Monthly emails of school highlights and reminders for recertification timeline. Many other potential opportunities are in the works; benefits are always evolving! REGISTRATION IS NOW CLOSED FOR THE NEXT AFMC™ CERTIFICATION EXAM WINDOW. PLEASE STAYED TUNED FOR THE NEXT REGISTRATION WINDOW. Again, the exam you are registering for must be taken within the examination window, so please ensure you can meet this requirement and all other examination stipulations above prior to registration. We want to ensure you are successful in your certification! Shortly after the registration deadline date, we begin to engage the certification class with a study plan to guide your preparation. Certification exam review courses will also be available to support your study. Want to stay informed of next exam window? Certification cancellations and refunds will not be available after the posted registration deadline. All cancellations of existing registrations must be placed via phone to the SAFM office prior to the registration deadline (508-944-1407).